This is what I consider to be perfection. A vintage pink farm house sink. With the dual drainboards. 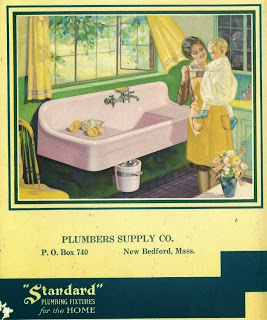 Made by Standard Plumbing fixtures. I love this sink. And I bet it weighs a ton. How in the world where these installed. without a big old wood cabinet to help hold that weight? 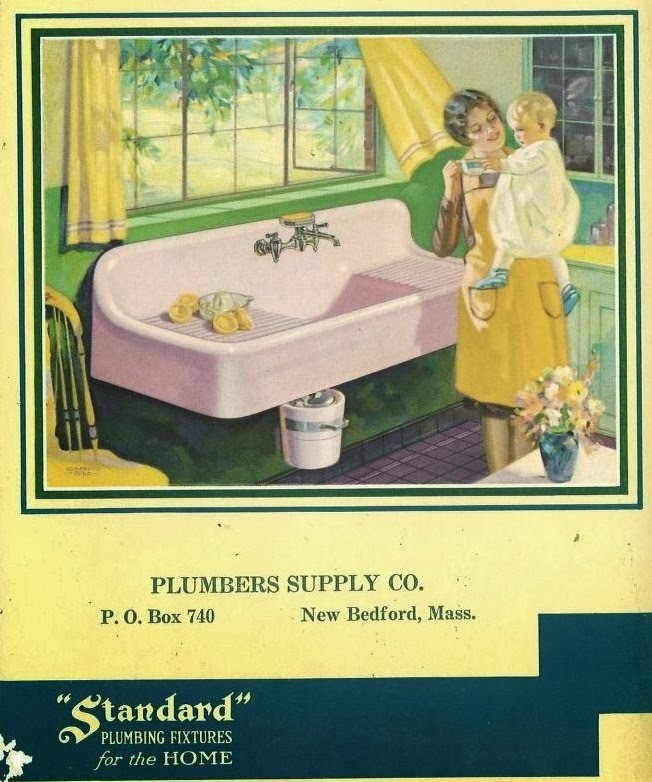 Anywho... this is another vintage advertisement from Standard Plumbing from the 1930. Showing off their beautiful sinks. 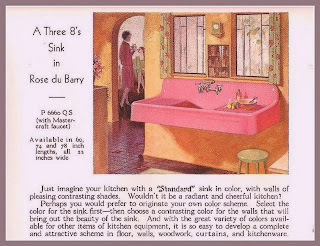 It is their Rose du Berry sink. That came in 3 sizes. Can you image how huge that 78 inch by 12 inch wide sink would have been?!? That is 6.5 feet long. And would have required 6 men to wrestle it into the house. And get it mounted on the wall. 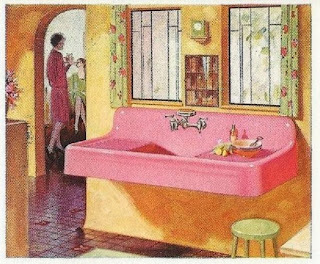 Then I came across another view, of this wonderful Standard pink farm house sink. This ad is from 1929. 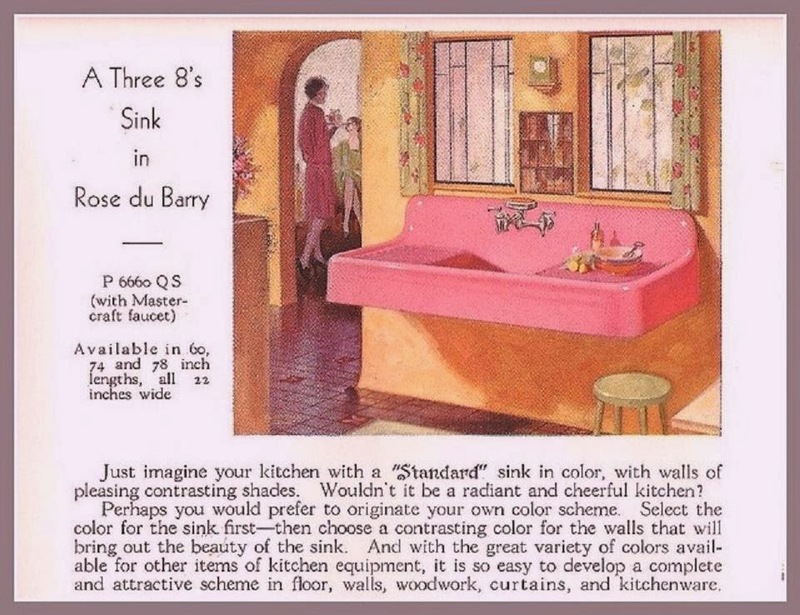 And as much as I have looked, I can not locate a picture of one of these pink beauties still in use. I am sure some of these survive. I just can't find a picture of one to share. First up... this stunning green sink looking all kinds of perfect. And it has its matching bucket too! What a beauty. And it has matching legs... to help hold up all that weight. 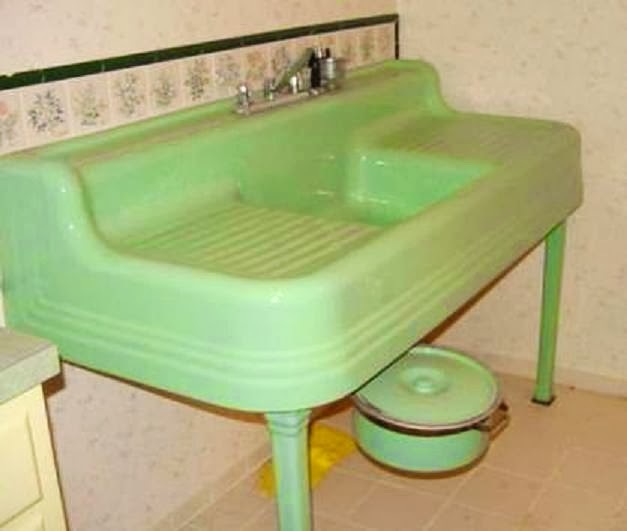 Oh I want that green sink. Both of them. My kitchen would be so happy to have one installed here! On that first picture, it looks like the bucket is installed. I know they have had garbage disposals for years but I don't know for how long. It's probably for slop for the farm animals.